At Kootenai Electric, we take safety very seriously. In our industry, thousands are injured each year in electrical accidents and fires—often with fatal results. The vast majority of electrical accidents can be prevented if people understand the dangers and steps they can take to be safe around electricity. Please review the safety topics below to learn more. 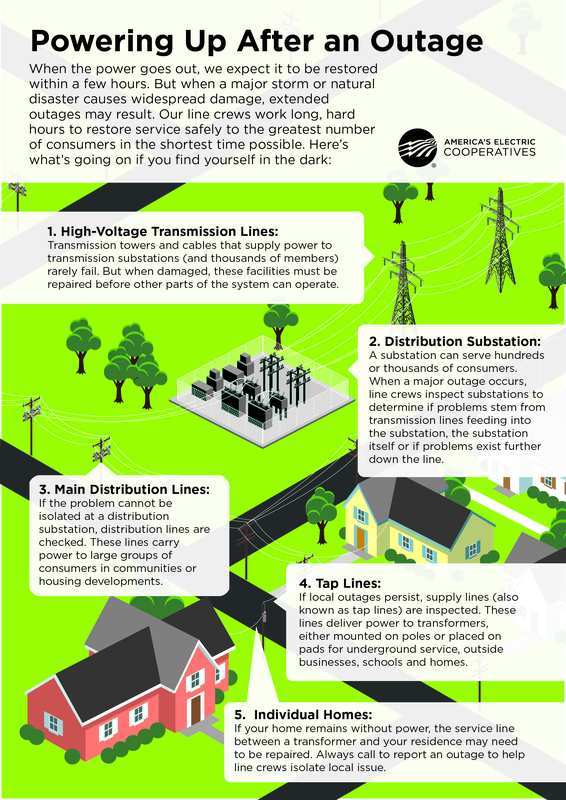 Power outages are usually infrequent and brief, but there are times, due to the weather and acts of nature, when your electricity may be interrupted. At KEC, we’re doing all we can to prevent power outages but on those occasions when they do occur, KEC crews are on call 24 hours a day and ready to be dispatched throughout our service territory. Use our SmartHub app.Create an account or log in to the app and you can also receive outage notifications. Follow us on Facebook for power outage updates or visit our outage map. Do not sit in an idling car in the garage to get warm. 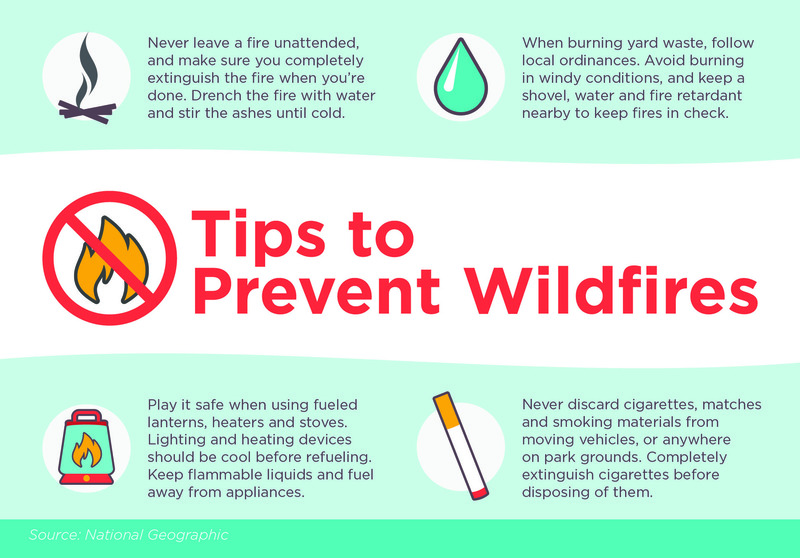 Never use a camp stove or charcoal grill indoors to generate heat. Unplug electronic equipment such as TVs, computers and microwaves. Lower the thermostat to a minimum. Turn off all appliances that were on when the power went out. Leave an outside light on so repair crews will know when power is back on. Have a battery-operated radio or TV. In the case of large outages, KEC notifies the media of the status of the outage. Have a cell phone or inexpensive, basic phone available to make and receive calls during an outage. Many of the latest phone models do not work without power. A power outage reported using our outage number is automatically matched to our computer database using the phone number you call from. If you're not calling from the phone number in our system you can enter the number tied to your KEC account or you can enter your KEC account number and still be automatically matched. The location of the outage then lights up on a map. This is why it is beneficial for KEC to have on file the phone number you are most likely to call from to report a power outage. Call KEC at 208.765.1200 (or 1.877.744.1055 after hours) to report a downed line or car accident with a KEC pole. ​​​​​​Never touch or go near a downed power line. Always assume power lines are energized. If your car crashes into a utility pole, your vehicle may be charged with electricity. If this is the case and you step out of the car, you will become the electricity’s path to the ground and could be electrocuted. Stay in the car, and tell others to do the same. Call 911 and mention the accident involves a utility pole. Do not leave your vehicle until a utility professional has told you it is safe to do so. Jump clear of the vehicle with your feet together and without touching the vehicle and ground at the same time. Continue to “bunny hop” with your feet together to safety. Doing this will ensure that you are only one point of contact and will not have different strengths of electric current running from one foot to another, which can be deadly. If you come upon an accident involving power lines, do not approach the accident scene. If you see someone approaching, warn them to stay away. Notifying staff to be available to work. Annually performing reliability improvements, including right-of-way maintenance. Sign up for KEC's outage alerts by logging in to your account. Have a plan for your pets and livestock. If your water supply is dependent on electricity, fill your bathtub with water. Ensure smoke alarm batteries have been changed recently. Also, consider how an outage will affect home security systems, garage doors and sprinkler systems. If you have a medical need that relies on electricity, the Food and Drug Administration published Guidance on Home Use Devices, recommending that individuals dependent on a medical device establish a plan for responding to a power outage and maintain medical information, a list of emergency contacts, extra oxygen tanks, battery backups and contact information for transportation services. Battery-powered radio or TV and extra batteries. Bottled water (one gallon per person per day). First-aid kit and prescription medications. Special items for infants, the elderly or family members with special needs. A variety of hand tools. Identification and copies of important family documents in a waterproof container. Cash (ATMs may be unavailable). Remember, power outages can be reported at 1.877.744.1055 or through our SmartHub app. Sign up for KEC outage alerts. Log into your account online or download the SmartHub app on your phone to stay connected with KEC. For more information visit Ready.govor www.fda.gov. With below freezing temperatures, snow and possibly wind in the forecast there is the potential for weather-related power outages. KEC has its crews on call 24 hours a day and ready to be dispatched throughout our service territory. The following are a few reminders and safety tips for winter storms. Stay away from power lines on the ground. Always assume downed lines are energized even if the lines are sagging or broken. Call KEC at 1.877.744.1055 right away to report them. In the case of large outages in rural/limited access areas where snow removal has not been consistent, members should be prepared for lengthy outages. When shoveling snow off the roof – look up and be sure there are no power lines above you. If you are able, keep your driveway plowed to help our crews have better access. Have a cell phone or inexpensive, basic phone available to make and receive calls during an outage. Many phone models do not work without power. Generators can cause a serious safety problem if improperly installed and could cause injury to utility workers and the general public. All backup generator installations must have a transfer switch installed in accordance with the requirements of the National Electric Code. Call the KEC office at 208.765.1200 for more information. For more tips on how to develop a family emergency plan and what to include in an emergency storm kit, visit the American Red Cross website. If a power outage does occur, please call the KEC outage line at 1.877.744.1055. Our outage management system tracks calls based on caller id. When calling in power outages KEC members should call from the phone number KEC has in its system to identify the location. If you aren’t sure which number we have in our system for you please call our office at 208.765.1200. Call Before You Dig is a free service up to KEC's meter that locates underground wires and lines in Kootenai County. Call the toll free number, 811, at least 48 hours before digging or excavating and have the following information ready: start date, phone number, type of work, job location and special marking instructions. After making this call the locations of underground wires and lines will be marked. This prevents digging equipment from hitting or cutting off power, water, phone, cable or gas lines. Accidental contact with a line can result in serious injury and possibly death. Damages to these lines can disrupt service to an entire neighborhood, and could include fines and repair costs. Please note: underground lines that extend beyond the meter or are on member-owned equipment may not be located unless you call for a private locate. To learn more visit the Idaho Digline or view the Member vs. KEC Responsibilities information below. For the safety of KEC employees and the public we track where backup generators are installed on our system and request all members who have installed generators call KEC at 208.765.1200. Generators can cause serious safety problems if improperly installed and could cause injury to KEC workers and the general public. All backup generator installations should have a transfer switch installed in accordance with the requirements of the National Electric Code. Transfer switch installations must be inspected by the State Electrical Inspector and we request that members provide KEC with a copy of the State Electrical Permit for the transfer switch installation. Also, GenerLink™has been approved for the KEC system. This is a five-inch device (for 200 amp service only) installed behind your electric meter by a KEC approved, licensed electrical contractor. When you connect a portable generator to GenerLink™ and start it up, GenerLink™ automatically disconnects your house from the electric utility grid preventing the possibility of back feed. Call us at 208.765.1200 or email kec@kec.com for more information. We also ask that members contact us at 208.765.1200 if they have any on-site generation (such as wind or solar). Knowing the safety precautions and legal responsibilities of your electric service is important for all KEC members. 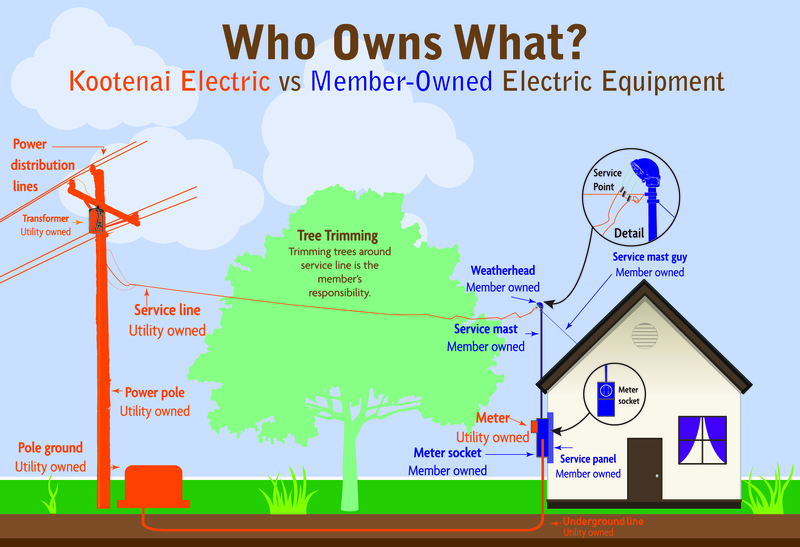 You may not be aware of what equipment is the homeowner’s responsibility and what is KEC’s responsibility. Electric meters are the property of KEC. Removing the meter with current flowing through it can lead to an electrical explosion. The person working with the meter could be injured or killed. If you’re planning on doing electrical work, contact KEC and we will send certified personnel to your site. Under no circumstance should meters be removed or relocated—temporarily or permanently—by anyone other than authorized KEC employees. For overhead service, KEC is responsible for the cable that runs from the utility pole to your home. This wire is called a “service line.” The service line connects to your house at the “service mast,” a vertical pipe-like structure attached to the top of the box that houses your electric meter. The service mast and the box that holds the meter are the homeowner’s property and responsibility. For underground service, KEC is responsible for the transformer, underground wire from the transformer to the meter, and the meter. If you have any questions about your electric service responsibilities, please call KEC at 208.765.1200. Overhead power lines carrying 750 volts or more are defined as high voltage and are usually not insulated. Lower voltage lines may be, but you still should not touch them. Any overhead wire is a potential hazard. 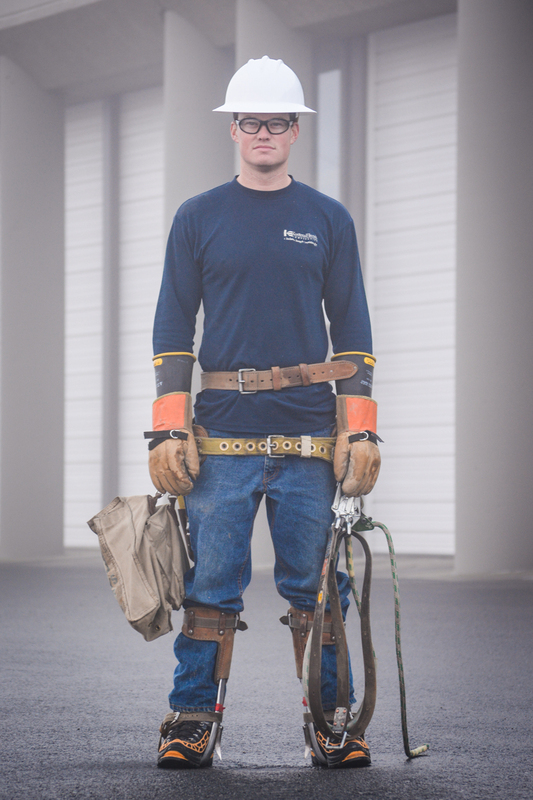 Keep at least ten feet away from high voltage overhead power lines and keep any tools or equipment away also. Use extreme caution when raising, lowering or moving pipe, rods, ladders, equipment or other metal materials near overhead power lines. When guiding a crane load line, make sure it and the crane stay at least ten feet away from live, high voltage power lines. Use extreme caution when painting or cleaning in an area where overhead power lines pass near to a building. Do not touch service wires that enter a building. Do not work on trees or signs closer than ten feet to live, high voltage overhead power lines unless you are trained for the job. If you must work close to such power lines, ask your supervisor to arrange with the power company to guard the lines, disconnect or re-route them. Never climb power poles or install equipment on them. If you are in a large flat area such as a field or lake, crouch down with your feet close together and get to shelter as soon as possible. Do not lie flat. Keep to low areas rather than on high points such as ridges of land. 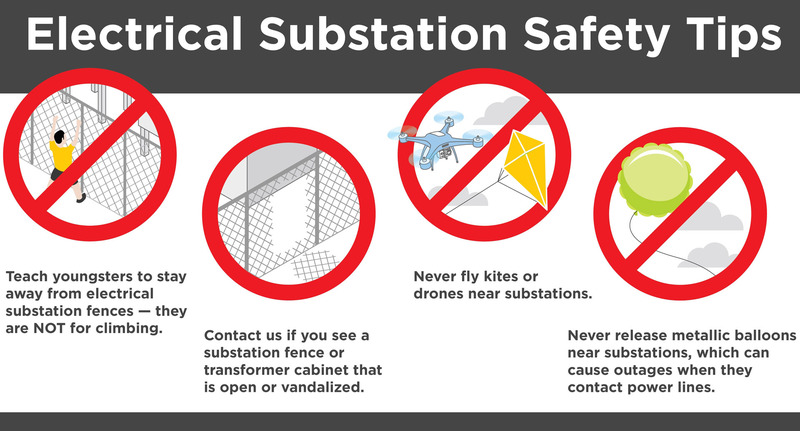 In many areas, electrical equipment may be located underground. Use extreme caution when digging or trenching any area serviced by underground power lines. Many new housing developments as well as older commercial areas have high voltage electrical cables running underground. Find out the location of underground power lines before digging deeper than 1.5 feet. Have the power company identify the location of underground power lines if there is any doubt. In Kootenai County call 811. Do not drive ground rods or other objects more than 1.5 feet into the ground within ten feet of an underground cable. Do not plant trees over underground cables. Electrical equipment and appliances sometimes pose safety hazards. Check that portable power tools are double insulated or are plugged in with a three-prong plug. Never break off or by-pass the third prong. Know where the circuit shut-off switch is for any electrical equipment you are using. Ask for proper instruction before using equipment you are not familiar with. Never turn on a machine or circuit if it has an "Out of Service" sign on it. Use a fused power bar with a three-prong plug to plug more than one piece of equipment into a single power outlet. Be sure the total power drawn is less than the circuit rating. Use only three-wire extension cords rated for exterior use in outdoor locations. Never run power cords or extension cords over or through water. 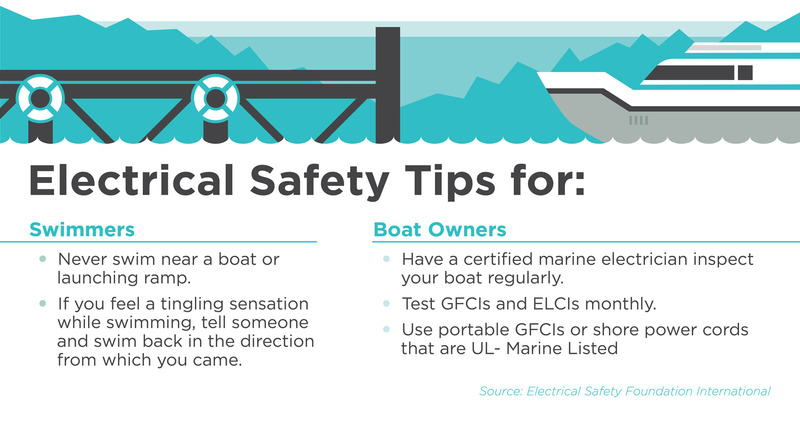 Never touch an electrical tool if your hands or feet are in contact with water. Never use electrical equipment outdoors when it is raining. If a fuse or circuit breaker repeatedly blows, move the equipment to another circuit. If it continues to blow, ask to have a qualified electrician check the circuit. Roll and store extension cords properly to prevent damage. Discard any cords with frayed, cracked or missing insulation. Keep extension cords away from areas where vehicles may pass over them. Disconnect tools before moving, adjusting, cleaning or repairing them. Have them "locked out" with your personal lock if they cannot be disconnected from the main power supply. Only qualified electricians should work on electrical service equipment or wiring. Call for trained emergency help. Keep everyone well back until the power is off. If the victim is no longer in contact with the power source, help the victim move to a safe place. Offer first aid if necessary. If the victim is still in contact with a low voltage power source (less than 750 volts), quickly look for the electrical power source and disconnect if at the source if possible. If this is not practical, you may be able to separate the victim from the power source using a dry non-conductive broom handle or other dry insulating material. Do not directly touch the victim unless he or she is separated from the power source. Although many materials are non-conductors at any voltages, they must be dry. If you cannot separate the person from the low voltage power source, stay clear and make sure others stay clear too. If the accident involves high voltage wires (above 750 volts), the ground itself may be hazardous. Stay at least 30 feet away and keep others away until trained emergency help arrives. If there is a danger of fire, call the fire department. Then use a chemical or gas fire extinguisher if possible. Never use water. If you are in a vehicle or on a machine that is in contact with electricity, stay where you are. You are safer where you are. If you attempt to leave, you may become a path for the electricity to ground. If you must leave a vehicle or machine that is in contact with electricity because of fire or possible explosion, do not touch the vehicle and the ground at the same time. Jump clear of the vehicle. Land with your feet close together. Do not fall onto your hands. You may become a path for electricity to travel between different areas in the ground. HOP OR SHUFFLE TO SAFETY. Keeping your feet together, hop or shuffle at least 30 feet from the power source. More information on electrical safety can be found on the Electrical Safety Foundation Internationalwebsite. The meter base is typically a rectangular metal box mounted near or on the outside of your home or business that the meter plugs into. Each meter base might look a little different. It belongs to the property owner and they are responsible for maintaining it in good serviceable order. If it’s damaged by weather or by any kind of accident, repair is the property owner’s responsibility. If you inspect your meter base and believe it needs repair, we encourage you to contact a licensed electrician. Alternatively, you can take a picture of your meter base and send it to KEC using the form below. KEC staff may be able to confirm those concerns or identify other issues. 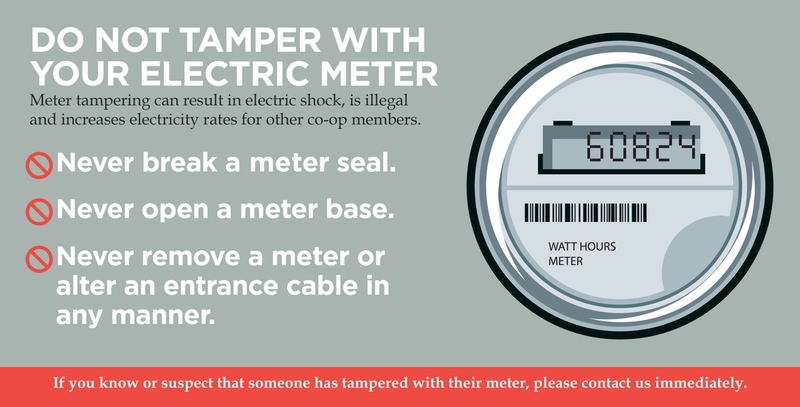 A damaged meter base can be a safety hazard for both members and KEC employees. Please note: the property owner is responsible for the meter base on their property. KEC does not accept responsibility for the meter base if you send information or images using the form below. KEC is making an investment in reliability and safety. Did you know trees are the number one cause of power outages? This is why vegetation management is such a critical component of maintaining the reliability of our system. This program focuses on the identification and removal of hazardous trees as well as the pruning of vegetation that interferes with our distribution lines. The determination of which trees to trim or remove is based upon a variety of factors such as the type of electrical equipment, tree species, visible tree defects, and proximity to power lines. Every year, KEC clears some 325 miles of power line easements and spends more than $850,000 doing so. This is an investment in a safe, and reliable electrical distribution system. We often get questions from members about why we need to remove or trim trees on their property. Generally, it is the result of the wrong tree growing in the wrong place. The result can be a significant fire hazard and endanger both our members and employees. This is also a problem in the winter when heavy snow load causes the branches to touch the power lines. We ask that members please plant trees well outside the right-of way and that they plant the right tree in the right place. Learn more at the links below. Test your alarms every month to be sure they're working properly. A good time to remember to change the batteries is when you change your clocks twice a year as daylight savings time begins and ends (if you hear the chirping low-battery signal, replace batteries immediately). Replace your alarms every 10 years; check the alarm for the manufacture date, and toss it if it’s at least 10 years old. Review the manufacturer’s documentation on your type of alarm.